Given another nice-weather weekend, our plan was to head down to Wallis on Saturday, stay in the Cabane d'Arpitetta, then on Sunday climb up to the Tete de Milon via the Crete de Milon, and finally descend back to Zinal via the Cabane de Tracuit. That's not quite what ended up happening. 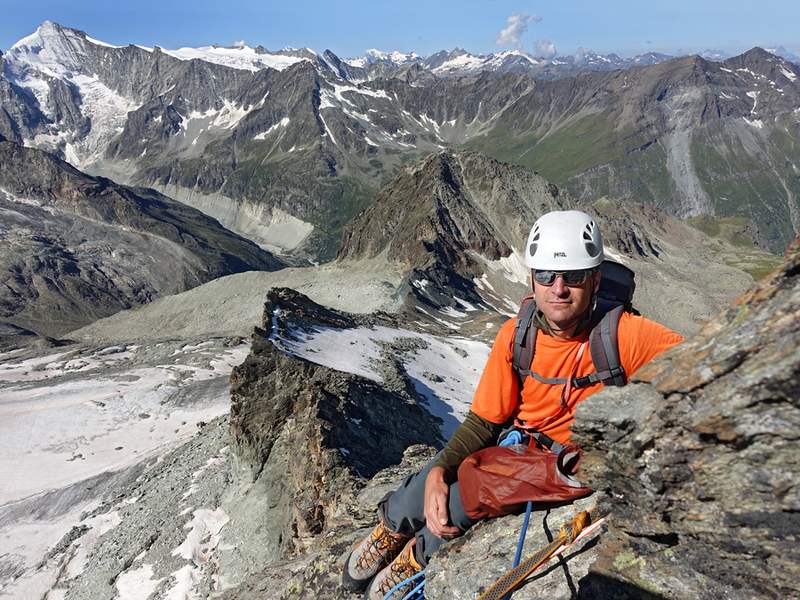 We decided to head down to Zinal on Friday night in order to avoid the chaotic Saturday morning travel and allow ourselves to sleep in a bit on Saturday. This went nicely, we had dinner in the train from Basel to Visp, ended up on the last bus up to Zinal, and had a good night's sleep and nice breakfast before setting off. The Pas de Chasseur sounds like a lot of fun, but given the heavy packs (normal mountaineering gear + some friends + dinner and breakfast since the hut doesn't do the normal food selection) we opt for the standard route instead. The hike up is really nice: the just keeps opening up as we climb. From our lunch spot we can see the Grand Cornier, Dent Blanche, the Zinal Rothorn, and the Weisshorn. Great stuff. Once at the hut we settle in and rest a bit before setting out on a reconnaissance tour to the Col de Milon. This leads us along the blue-white trail up and along a nice moraine. The going is easy (and should be easy in the dark) and along the way we get nice views of the ridge that we'll be climbing the next day. The path down the other side of the pass looks entertaining: it's steeper but it has chains and cables. Looking up the Crete de Milon from the moraine. Back at the hut we hang out and enjoy the views a bit longer before doing dinner: soup from the hut and then our own dinner: tortellini served with grated parmesan, lemon rind, diced salami, killed onions, and frisee. With that we had a "salad" that consisted of a couple carrots. After dinner there was more enjoying of views (the colors of the sunset on the glacier on the back of the Zinalrothorn were just spectacular). As usual, we make a fairly early night of it. The plan for Sunday is to get up around 4:15 and be on our way by 5:00. This doesn't end up working out because greg's idea of setting the alarm on his phone to "silent" doesn't work (frustrating since greg was awake at 4:10 and decided to wait for the alarm to go); greg wakes up at 5:00 and we're underway by 5:40. Oh well, we don't think we have a super-long day planned: according to our book it's about an hour to the col (which we've verified) and then 4-5 hours to do the ridge (the SAC guide has the ridge listed as 2.5 hours, but that can't be right). Up we go. It's not super-dark anymore so we don't have to use the headlamps anymore, but we do have enough darkness to see at least one group on the Schaligrat of the Weisshorn and another group (from our hut) climbing the Weisshorn's West side (there were three groups at the hut that were doing routes there). At the Col de Milon we put on the climbing gear and rope in. The initial stretch is mostly scrambling on the North side of the ridge and we do that on a short rope. The route finding isn't trivial, and things are at times unpleasantly loose, but we make progress. 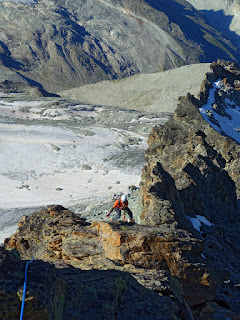 We also go around the first gendarme, which requires a bit higher level climbing (5a) than we feel up to doing in the boots (though there are supposedly some bolts in that route) and then a bit of abseiling. On the other side of the gendarme we start climbing along the ridge. An aside here, because it's relevant in what comes: greg managed to forget his watch in the hectic of the Friday evening departure. This means that we don't have a GPS track for after the fact, but more importantly it meant that while underway we didn't have easy access to either the time or our altitude (we normally keep our phones packed away while climbing so that they neither get in the way nor get slammed into rocks). 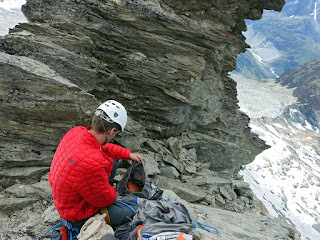 The ridge isn't overly technical (according to the books it's all 4a and below) but there are no bolts, so we are using slings and the occasional friend along the way as protection. The lack of bolts also means that the person leading (Andrea through most of the day) doesn't have obvious indicators of what the correct route is, so there's a lot of route finding. Combining these factors with the fact that we were going from stand to stand instead of simultaneously climbing (it was way too exposed and a bit too difficult for us to do that), we ended up being very, very slow compared to what was obviously expected. Between the usual climbing-concentration and the lack of the watch to provide constant easy feedback on time this fact didn't completely register until Andrea forced an evaluation of the situation and we looked at the time. Our plan was to be done with the ridge and up on the peak before 13:00 (this was originally noon, but it got pushed an hour because of the oversleeping). We got there by "conservatively" planning 7 hours to finish the 4-5 hour ridge. Given that there's a stretch across a glacier on the other side, being earlier would clearly be better. It's now 15:00. We are, if you can believe the GPS-based altimeter on the iPhone (who knows), at between 3590 and 3600m. The peak is "only" 3680 and once we get to the last tower, which we go around instead of climbing, the route is supposedly easy. But, we just don't know how far that really is. Because the ridge is pretty steep up here, you can't see past the next tower, even when you're on top of one. So we don't know how much is really left. Next factor, weather: the forecast called for the usual summer development: a clear morning followed by cumulus clouds and possible rain/storms in the evening. 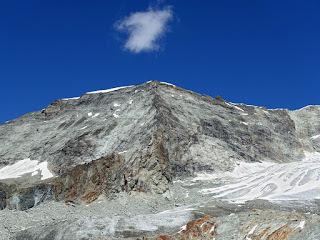 There are definitely clouds building around the high peaks, including the Weisshorn (though the Tete de Milon is still free) so this could become factor. There are also some lower clouds starting to form. Not a plus. Last factor, us: Andrea, who did most of the leading so far, is really tired. For a couple of pitches she was ok following, but that's not working any more. Because we're on a ridge without abseil exits, there's really no plan B, you either finish or you call Rega for a helicopter rescue. That's not an easy thing to do psychologically, so needless to say, the conversation didn't progress quite that calmly and rationally, but we did think through those points before Andrea called for the helicopter. While waiting for the helicopter to show up we packed away our gear (except the climbing belts) and talked through how we ended up in the situation. The helicopter was interesting. First they showed up to verify where we were, then they flew off after we waved. This was kind of weird since we didn't know what was going on (boy, I hope we didn't wave them off), but they were just flying down to the Cab. d'Arpitetta to drop off the medic (since we didn't need him). They eventually came back and lowered down the rescue guy who looked around, asked if we were ok, checked Andrea's gear, and hooked her to the winch. They pulled her up and then flew off back down to the Cabane, where she talked to the medic and gave our details for the report. Greg and the rescue guy waited for the heli to return, he hooked greg to the winch, and the heli pulled him up and flew down to the Cabane to drop him off. They then flew back to the ridge to pick up the rescue guy. We, after a brief chat with the medic, opt to walk back down to Zinal in order to have a bit of psychological distance between the helicopter ride and the bus home, so we say thanks and head down to the hut. After rearranging the packs and grabbing some more water at the hut, we start a fairly quick trip back down to Zinal in order to catch the last bus out of the valley. That's not a particularly fun walk down, but we do manage to catch the bus. We are really not ready for long alpine climbing tours in that difficulty level. We're much too reliant on going stand-to-stand, which makes us much too slow. Do a better job of setting (and enforcing) "last possible times" while climbing (we do this on normal hochtouren, but somehow didn't do it well this time).